Have you ever wondered how those kids on TV got there? Does your child have what it takes to be a working actor in Hollywood? This is a how to book of what it takes to get an agent or manager in Los Angeles without spending thousands of dollars. The book also explains about headshots, Coogan accounts, acting coaches, work permits and what is expected of you and your child on set. All this information is interspersed with real life stories that have happened to parents and kids at casting offices and on set. Some are funny, some sad and all are true. They can be helpful guides of what to do and what not to do when navigating the crazy world of showbiz. 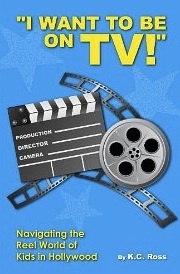 Author KC Ross is a Hollywood insider who has worked as a casting director, producer and publicist over a 25 year span. Ross has also chauffeured kids to and from auditions, sets and rehearsals which is the source of many of the storie in the book. Following the idea that fact can be stranger than fiction, KC used personal knowledge and experiences, then interviewed friends and other actor’s parents and several industry professionals to gather the many funny, factual and outrageous stories in this book.